Not everybody was amused by the BBC's famous spaghetti harvest documentary. And many viewers - including BBC staff - who had been taken in by the Panorama April Fool criticised the use of a serious factual programme to make an elaborate joke. But the broadcast, which showed a Swiss family harvesting spaghetti from trees, has gone down as one of the best April Fools of all time. My late mother was always fascinated by this spoof. 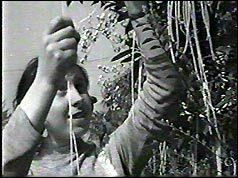 We never had real spaghetti at home-only the sort in tin seemed to be available for quite a while after the war - but her favourite tale was always the "spaghetti trees" and how everyone believed the documentary, because Mr Dimbleby was on it !! Well done BBC. Classic April 1st. Why I remember this I'm not sure because I wasn't around in 1957. It must have been repeated some time in the '80s because I can clearly recall my sisters falling for it hook, line and vermicelli. What's perhaps most intriguing about the hoax is that spaghetti was once considered an exotic food in Britain. I was five years old and remember my mother saying that she never knew spaghetti grew on trees! I remember thinking "Spaghetti? What's spaghetti?" We hadn't even had the tinned variety by then, let alone sticks of the stuff! A brilliant item which showed that the BBC had a real sense of fun. I was 11 when this was broadcast but I knew it was a spoof even though we never ate spaghetti. I can't really understand how people were taken in by it. I still, however, think it was a nice idea for April 1st. I was 13 at the time and my parents had just rented our very first black and white TV. We still found it a novelty and watched nearly all the programmes to the detriment of our school homework. I'd never eaten spaghetti at the time and when the footage came on of the Italians harvesting the long tubes of spaghetti I was stunned. It was only a few days later when people were talking about the clever spoof that I realised how well I had been fooled. It was a bitter disappointment. I was 11 at the time and remember well the howls of protest from those who took it seriously. I thought it was hilarious, kudos to the Beeb for that one. Of course we all fell for this hook, line and sinker. It was the most wonderful hoax, delivered with all the gravitas Richard Dimbleby could muster, and I think the late lamented Scottish reporter with the beard (whose name escapes me) was also involved. I remember my Dad's belly laugh to this day as an impressionable 10-year-old with little experience of something as exotic as spaghetti. Thankyou, thankyou. I have been asking people about this story for nearly, oh, my, 50 years, and no one I know remembers it! It was 11 days from my seventh birthday and I loved Jack Paar, who aired the story here in the States. I recollect it as an equalising experience between my parents and I - we all thought it was so hilarious. I remember it a lifetime later. Yes I remember - my girlfriend Jill would not talk to me for a week as she insisted that pasta really grew on trees and I told her she was absolutely silly to think that. I still think about it and am now 62. I viewed the spaghetti harvest BBC video in April 1967 at a local pub which had just turned on the TV. I watched with disbelief until, at the end, the host of the show, Jack Paar, announced it was a classic 'gotcha'. I remember it very well and still recall sitting there watching it quite happily until towards the end there was mention of, I think, Macaroni trees showing the twisted macaroni hanging from the branches and suddenly realising I had been well and truly had. What really helped the Beeb to get away with it was the dulcet tones of Richard Dimbleby in his solid, state funeral tones. I wasn't even born when that was broadcast, but it obviously made an impression on my folks - they still talk about it to this day! I saw this as a child on the Tonight show - I have no idea what I was doing up that late. Jack Parr was dead serious when he introduced this and I was fascinated for the first few minutes. Suddenly it occured to me that spagetti was made, not grown. It has remained in my mind as one of the funniest things I ever saw. I have been telling people about it for years and was thrilled to have an opportunity to see it again. Thank you for having this online! I just shared it with my wife, after telling her about it for over 30 years. I watched it with my father, as a child. It is my oldest memory of sharing humor with him: even at the age of 6 I was in hysterics, as was my father. It remains one of the singular most humorous items I have ever viewed on TV, even to this day. Thank you for letting me relive that childhood memory, and to share it with my wife. I remember seeing this famous spoof with my sisters when we were young teenagers. Since Richard Dimbleby was somewhere between the Queen and God as a figure of authority, we were very puzzled, because we were pretty sure that if spaghetti was grown anywhere, it would be in Italy, not Switzerland, or maybe not even grown but manufactured. At the very end, Richard Dimbleby wished his audience a "good night, on this evening of April first". We thought it was probably an extremely ingenious hoax. The background music was pretty good as well. That prank was the greatest. I still remember watching it. It was clean and funny. I am dissapointed that it didn't start a "tradition" and looked for one the following year. As a little girl in the '50's, I remember my Dad howling with laughter at a "short subject" shown before a movie we went to see. I didn't understand why he was laughing. I thought it was very interesting to learn how spaghetti was harvested. I actually saw this programme & believed it! In1957, living in Yorkshire and not being world travellers, we had no clue as to what spaghetti was or what it looked like. Great April Fool's prank! So glad you printed it. My dad loved Panorama, so of course we watched the spaghetti harvest with great interest. We were completely taken in. Richard Dimbleby was so revered that he could have sold us the Brooklyn Bridge! I remember my dad saying afterwards, "So that's where spaghetti comes from." We hadn't a clue - all our spaghetti came out of tins! ..and then laid out to dry "in the warm Alpine sun"